The claim is against no more than two defendants. A "fixed amount of money" means that the person bringing the case can calculate exactly how much they are claiming from the other side. For example, a builder has done work for someone who has refused to pay for it. The builder knows exactly how much was due on the invoice. If interest is claimed this should also be calculated prior to issue. The builder is bringing a claim for a fixed amount: the value of the invoice plus the amount of interest that has accrued on it. If the amount claimed is not fixed - for example a claim for damages in respect of an injury where the level of damages will have to be decided by the court - it cannot be issued online. The online system provides a very limited amount of space for the details of the claim - a maximum of 1080 characters over 24 lines. Therefore if the claim cannot be described within this space it cannot be issued online. In addition a claim against a government department or the monarchy is not eligible for the online procedure. Minors - anyone under the age of 18. Protected parties or "patients". A protected party is someone who is deemed to lack the mental capacity to bring court proceedings as defined by the Mental Capacity Act 2005. People who are entitled to a reduction in or are exempt from paying court fees. A person who is in receipt of Legal Aid. Vexatious litigants - in some cases the High Court will make an order that a particular person is not allowed to issue court proceedings without permission. These orders, known as civil restraint orders, may be made against a person who has a history of issuing meritless or frivolous claims - the person then becomes known as a vexatious litigant. At the end of the process the system will provide a unique claim number which should be noted down. Once the information has been submitted the fee will automatically be incurred. 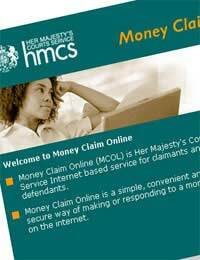 If a claim is submitted in error or a person wants to withdraw their claim they will have to contact the Money Claim Online helpdesk before 10.00 am on the following morning if they are to have any chance of avoiding the fee. Online claims are issued through a processing centre based at Northampton County Court. Once the claim has been issued the court will send a claim form to the defendant together with forms for acknowledging service and defending or admitting the claim. If a claim has been issued online the defendant will be able to respond to it using the online procedure, if he chooses to do so. My ex partner yet again is not sending maintenance for our daughter through CSA. Now owes me £1500. Can I do it online please? The link here, will tell you all you need to know regarding enforcement of child maintenance and the process you need to go through. My ex partner yet again is not sending maintenance for our daughter through CSA.Now owes me £1500. Can I do it online please? You can see more in addition to the information contained in the article via the link here. As long as you have evidence the money is owed, then you will have a case. My former tenant owes more than a £1,000. He promised he's going to pay back but hasn't done so. He's deliberately not responding to an email I sent him. I have his business address which seems to be a home address. Could I start a claim? If you have evidence your tenant owes the money and has promised to pay, then yes, you can begin a claim. HiI purchased a vehicle from a dealership for £5900 on 18/07/15 and paid in full after a test drive with it to be delivered on the 21/07/15 (agreed verbally on delivery date) with 12 months MOT but have invoice for everything else.The vehicle failed its MOT and the dealer was not contacting me for days after the agreed purchase date with me not knowing what was going on. 2 weeks after the agreed purchase date I told him I now required a refund due to him not delivering in the agreed timeframe. He agreed to a value of £5700 less a "loss of earnings" due to being re advertised which I declined. Then another 2 weeks later after returning from holiday I got back in touch via email to chase my refund. It was finally issued and was less the £200 which I did not agree to and have emails as proof. He is now ignoring my calls and saying I am not entitled to my full money back. Where do I stand? I am down £200 plus an additional £400 in car rentals as he has messed me around for a month and now if I have to make a claim that will cost me an additional £25. Any help or advise would be much appreciated. I suggest you speak to Citizens Advice in order to get some professional legal advice regarding where you stand. You should have gone through all ways in order to try and recoup the money owed to you, only using the small claims court as a last resort. However, if the dealer has consented to a refund, it should be for the whole amount, it is not your responsibility to take care of the car dealer's re-advertising. Hi I purchased a vehicle from a dealership for £5900 on 18/07/15 and paid in full after a test drive with it to be delivered on the 21/07/15 (agreed verbally on delivery date) with 12 months MOT but have invoice for everything else. The vehicle failed its MOT and the dealer was not contacting me for days after the agreed purchase date with me not knowing what was going on. 2 weeks after the agreed purchase date I told him I now required a refund due to him not delivering in the agreed timeframe. He agreed to a value of £5700 less a "loss of earnings" due to being re advertised which I declined. Then another 2 weeks later after returning from holiday I got back in touch via email to chase my refund. It was finally issued and was less the £200 which I did not agree to and have emails as proof. He is now ignoring my calls and saying I am not entitled to my full money back. Where do I stand? I am down £200 plus an additional £400 in car rentals as he has messed me around for a month and now if I have to make a claim that will cost me an additional £25. Any help or advise would be much appreciated. @katie - yes, you do, especially if you can prove that the money lent was not a gift and that person was expected to pay it back. The fact that they have already paid some of the money owing, will help you prove this. Emails, texts or any other correspondence relating to the fact that the money was given in good faith that it would be paid back will also help your case. I suggest before you take it further, that you write a letter telling the person that if the money is not paid back by a given date, then you will take it to a small claims court and they may be also liable to costs. Please see MCOL link here . I hope this helps. I lent someone 675 pounds and they promised to pay me back. Since I lent it (January) they have given me 100 in cash and 100 through bank transfer but is now claiming he owes me no more! I have texts but the rest was verbal, do I have a case?? @Cal - as long as you have proof of purchase and anything else in writing then yes. You should also report the owner to Trading Standards asap, so the breeder can be investigated and so that no one else falls victim to this scam. I purchased what I believe to be a pedigree Puppy advertised as such and paid a small fortunes for him.I was assured pedigree papers would follow/be sent to me. I have not received them and seller is now ignoring all attempted contact. As dog was going to be used for stud this is now impossible without papers. Can I therefore take seller to small claims for part part refund/for what the dog would have sold for if advertised as no papers with. @viv - you need to inform the police first and foremost to make sure, if this is the case, the retailer is looked into and stopped, please do this asap. Hello, I was hoping for a few words of advice please.My description (above) of being fraudulently robbed of £169.95 by some kind of deal set-up posing as a retailer.Having given you my email address, can a response come to me please, to advise.Many thanks. A company has committed fraud against me.It is called Bidstreet Shop.It advertised a household item in the ;'What's On TV' magazine - a knockdown offer on a robot mop for £11. 95.I preferred to look it up online and order online.The item was never delivered but the cost was debited from my bank account.I had unwisely given my card details.Within three weeks of making the order, the amount of £158 was also debited by them from my account.I now know they call it 'for membership'. On the website there was no visible info that this was other than a retailer.I spoke to the bank Fraud dept who put a stop on any future similar scam, and cancelled my card.Plus, I constantly wrote to Bidstreet for a refund which they, of course, claim they don't owe me.I am 73 years old with failing sight. To me, this is a large amount.But is it too small to take them to small claims court?I have not yet spoken to the police. I PURCHASED A GARMENT IN DEBENHAMS, SWANSEA.I RETURNED TO THE DEPARTMENT STORE TO POINT OUT MY PROBLEM THAT THE LINING WAS COMING APART BUT THEY REFERRED ME TO JACQUES VERT - THE MANUFACTURER AND I RELUCTANTLY ACCEPTED A VOUCHER TO THE VALUE OF £20.00 FROM J/V. NOW ANOTHER TWO SEAMS IN THE LINING HAVE COME APART AND I AM WONDERING AS THE £20.00 WAS FOR THE INITIAL PROBLEM DO I HAVE ANY CHANCE OF HAVING THEM DEAL WITH THE TWO NEW PROBLEMS. I NOW CONSIDER THAT THE LINING IS OF A VERY POOR QUALITY AND WILL CONTINUE TO CAUSE PROBLEMS MAKING THE GARMENT UNWEARABLE. On the 3rd of december I called O2 to discuss unlocking my phone. Since then and after two weeks of repeated phone calls not to mention the stress and money it has cost me, It still hasn't been done. I can forgive and accept the first 20 minutes. However having spent four hours of my time chasing this matter I feel I have to recoup not only for the phone calls but for my time. I have to buy an item then claim the purchase price back. Unfortunately the item is secondhand and I am struggling to find a secondhand one. What is a reasonable length of time to take to search for one secondhand ? four weeks, two months ? three months ? If I can show none are available after this length of time, is it reasonable to seek the price of a new one ? If I can only ask for the replacement cost of a secondhand one, how do I obtain a reasonable value if none are available and I cannot find what others sold for ? thank you. I have ordered a washing machine online with a well known high street chain, they have changed the delivery date four times now,can I claim for breach of contract and the cost of endless phone calls,this is not the first time they have done this,the same thing happened last year with a microwave oven,i am at my witts end ,the stress is awful,thank you.